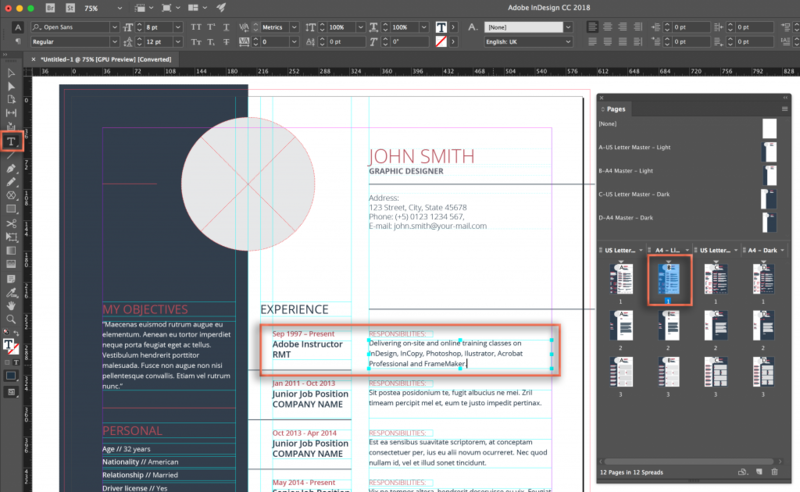 Home / Adobe InDesign / Adobe InDesign: I Can’t Edit an Adobe Stock CV Template! 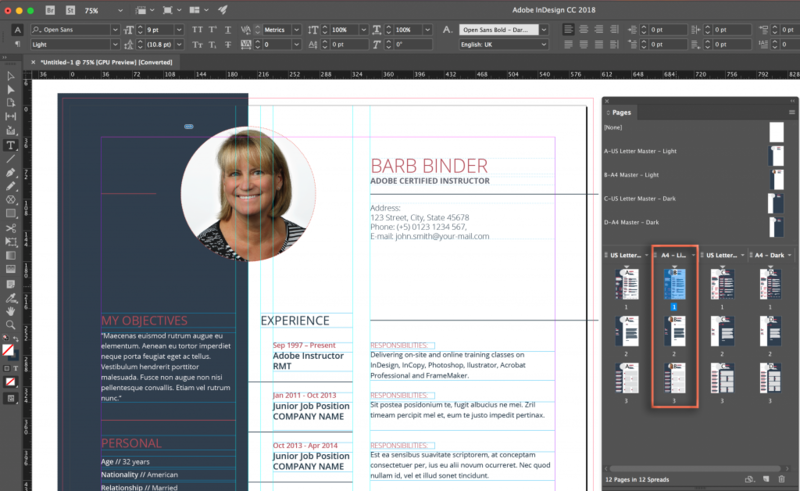 Adobe InDesign: I Can’t Edit an Adobe Stock CV Template! Adobe recently began offering free InDesign templates on http://stock.adobe.com. 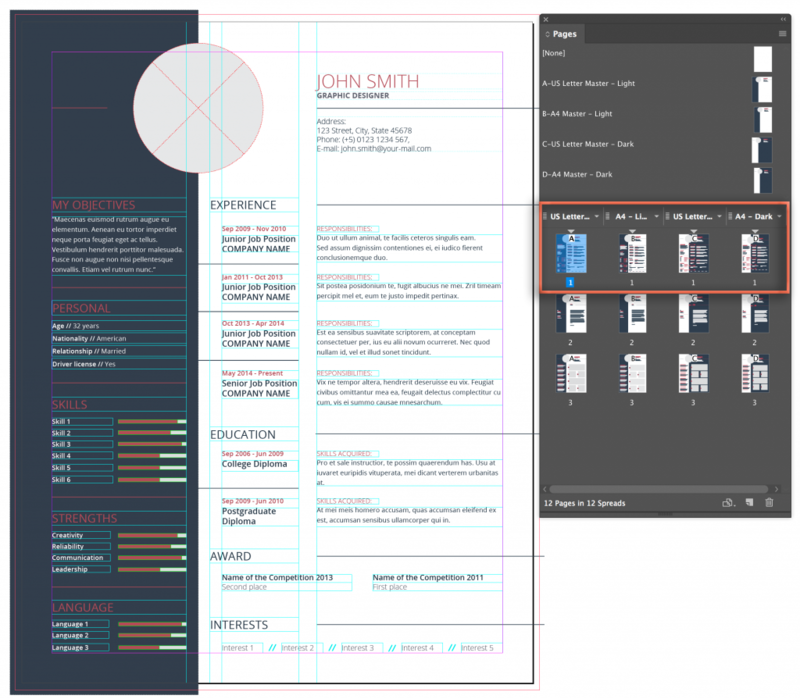 The idea behind templates is great—someone with InDesign experience and an eye for design creates a template so that a new user can simply open the template, edit the content, save and print. Except in my experience, it isn’t that easy for most people. Unless they already have a basic understanding of InDesign, they get stuck as soon as they try to edit their name. Most of the template questions I get come down to understanding one panel in Adobe InDesign: the Pages panel. 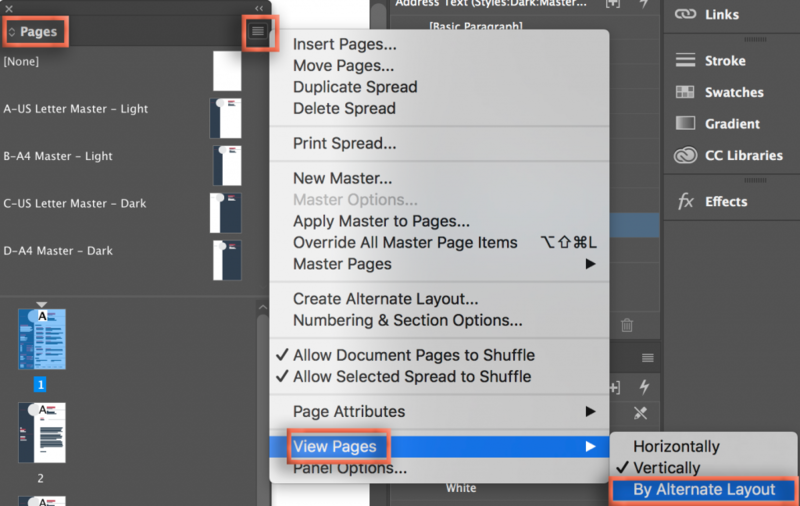 Open the template in InDesign, and save it as an InDesign document. 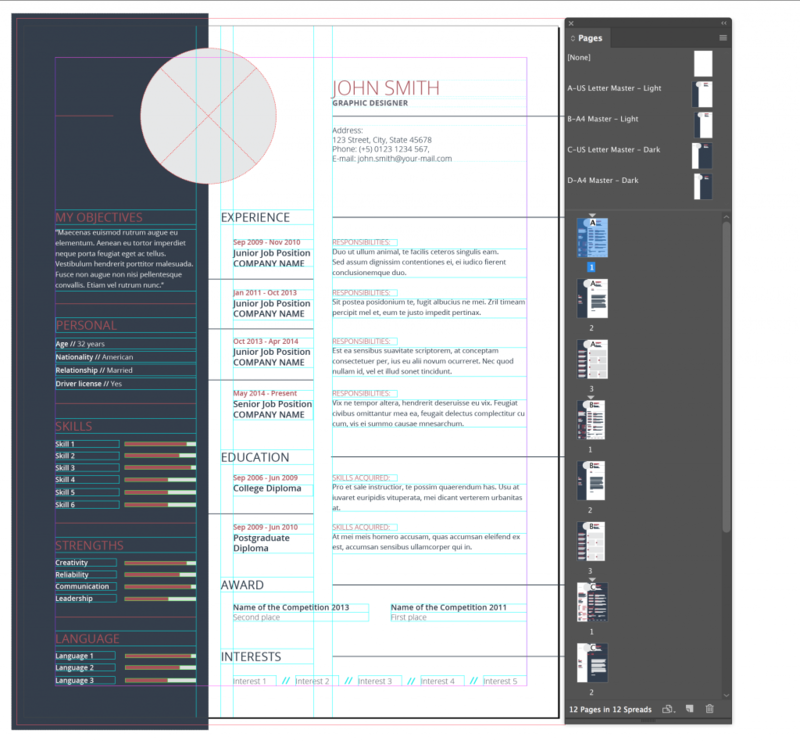 You will design your CV on the pages 1-3 of your favorite. Let’s say you pick the second page one as per my screen shot (A4–Master Light). Double click that page 1 icon and start adding your information to the body of the document. Use the Type tool (the T in the Toolbox on the far left) to add, delete and format the text. 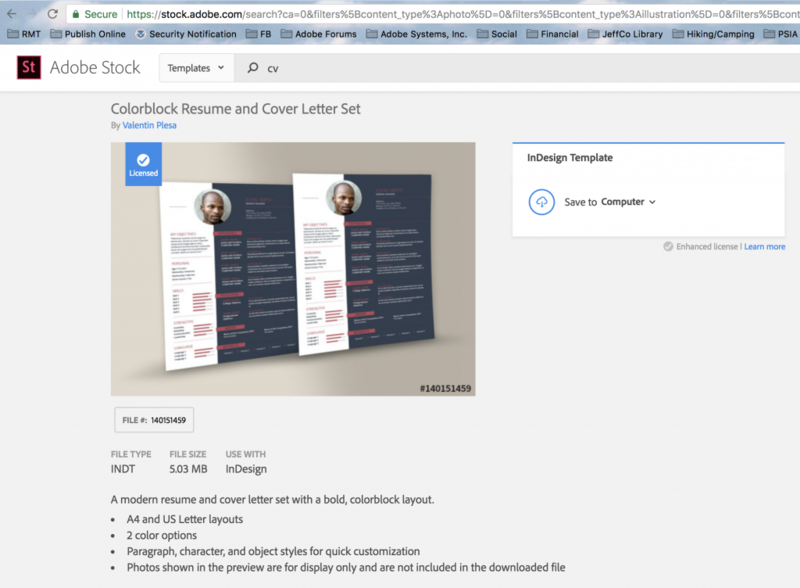 To edit the photo and your personal information, you will need to navigate to the Master page behind that Body page, so note the letter that appears on each thumbnail. A for column 1, B for column 2, C for column 3 and D for column 4. Double click the name of the corresponding master page. Now you can update the information at the top of the page. In my screen shot, I’m in the 2nd column and a B appears on each column two thumbnail, so I need to double click on B-A4 Master-Light. To return to the Body pages, double click the icon for your page 1. The photo and personal info is updated on all the pages in that column. If you don’t need the other pages (even the 2nd and/or third pages of the column you are using), consider dragging them to the trash can in the bottom right of the Pages panel to delete them from the document. They will still be in the original template, if you decide you need them later.